- Is there a giant in your life that is trying to bring you down? - David faced an enormous giant and walked away victorious. 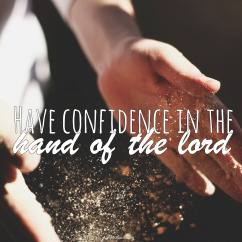 - Have confidence in the hand of the Lord upon your life. - He can remove giants in whatever form or size they may present themselves. - What an awesome picture of the Lord standing with us and giving us strength. 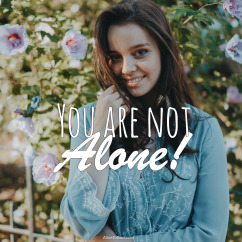 - HE is standing with you today – you are not alone. - HE is closer than you could ever think or imagine. - HE is more interested than you realise, and He will give you the strength you need. - Never underestimate the Word of God in your daily life. - His Word is powerful, living and active and able to achieve what He has said. - Your situation may seem unchangeable, but His Word is more powerful than that. - His Word does not change, and it will carry you through what you are facing. 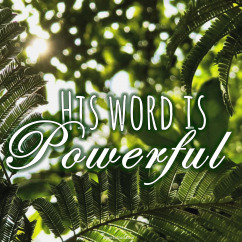 Prayer: Lord, thank You that I can depend and rely on Your powerful and enduring Word in my life. If You say it, I believe it and that settles it! Amen. - What a joy it is to know that we can experience His strength and power daily. - In the end, we desperately need His strength in our lives. - May He fill you with power and strength and make you strong. - When we know His strength as a reality, we can face any challenge. 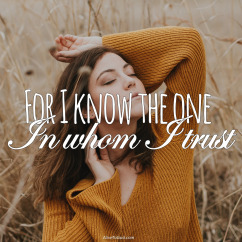 - Do you ‘know’ the One in Whom you trust and believe? - Our lives can be lived with confidence because we know Who we believe in. - Be persuaded and convinced that the Lord will undertake. - He knows what you have entrusted to Him and He knows your secret requests. 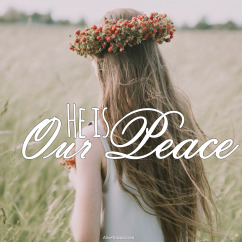 - The Bible tells us that ‘He is our peace’. - When our Saviour was born, He brought us peace and when He left, He gave us peace. - Peace in your heart and mind is what He planned and purposed for you. - So don’t be worried, distressed or troubled, He will take care of you. Prayer: Lord, forgive me for being so concerned and worried about so many things. I choose Your peace and I choose to live by Your peace and I will not be afraid. Amen. 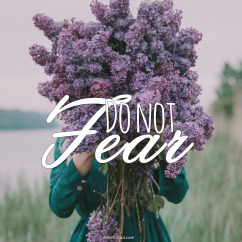 - Fear is not part of the Lord’s plan for your life. - Although there may be much to fear, we do not need to surrender ourselves to it. - We have a different Spirit that is in operation in our lives. - It is His Spirit, and He empowers us, fills us with love and gives us clarity of mind. - The Lord has placed within each one of us unique and special treasures. - These treasures are gifts that He has place in our lives. - These gifts were designed to be a blessing to others and to Him. 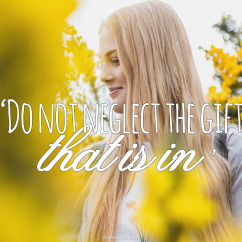 - Don’t hide your gift, but let it shine and be the blessing God intended you to be. 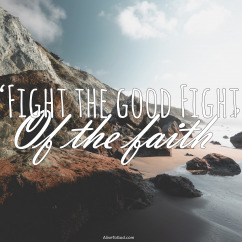 - Our faith life is not a ‘walk in the park’ but it is a ‘good fight’. - A ‘good fight’ is a fight that we win and one that leads to victory. - There are many things along the road that would like to distract or sidetrack us. - Let us stand secure and fight the good fight, expecting Him to help us!